The coordination and oversight of one’s well-being is of paramount importance to us. The challenge is that most of us don’t admit when we need help and this is no different for our Elders or for anyone caring for a loved one. Sometimes we are unaware that we need support. Imagine you are not alone and you have the guidance and support you need to make appropriate choices as time marches on and other concerns arise. Care Management is the heartbeat of our Life Care Plans. We provide hourly services and short term contracts as well. We treat families as our own. We are the liaison for our clients – advocating on their behalf, overseeing care coordination, and supporting their loved ones who are concerned and overwhelmed. We assist families in crisis – from the emergency room visit or hospitalization, as they transition home with care or to short term rehab and we facilitate the best possible placement to a long term care facilities. Proactively we work with families to evaluate all the available the options for immediate and future planning. This process helps families make informed choices. Often times we provide counseling and coaching to our clients and their loved ones. They appreciate having us by their side and they know they are never alone – we are a phone call or visit away. Navigating through the long term care maze is daunting. Who is the best choice and which facility is appropriate for your loved ones? In addition, there are programs, resources and entitlement benefits that most are unaware of and would not know how to access. We are passionate about having quality care & appropriate placement for your loved ones. Our clients and families benefit from our creative strategies and solutions. Thinking out of the box allows our clients to stay at home or in their community with care when other’s thought that it was not possible. We work tirelessly to insure that our healthy spouses remain financially intact while their beloved sick spouse receives proper care in the best environment possible. We work directly with excellent agencies, facilities and communities who provide the highest quality of care, resources and services. We are happy to refer you to experts who understand the issues facing seniors and those with health challenges. These hand selected professionals are dedicated to maximizing quality of life, the preservation of assets, and securing benefits for our clients. 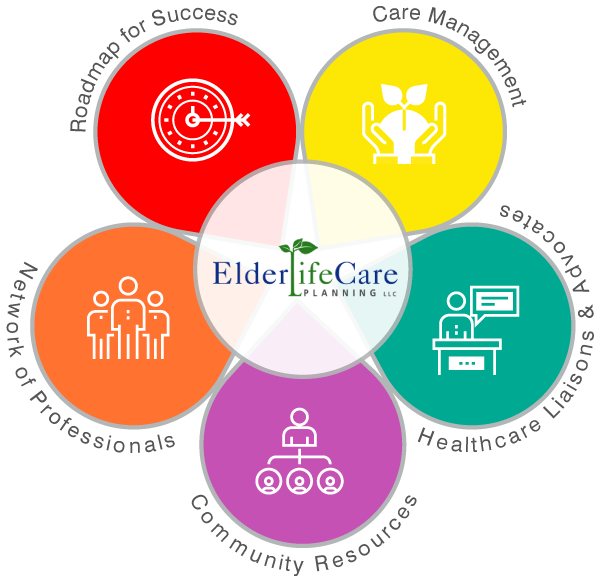 If you are a proactive thinker interested in planning before the crisis or someone who has found themselves in an emergency situation with a serious illness or injury – you would benefit from our holistic Life Care Planning. We start by evaluating where you are today and where you would like to be in the future. Identifying what is important, choosing what is best and knowing that you have a plan in place to guide you with our continued support is invaluable.